Fort Smith is known for lots of things. But, being an old town with new life is one of its current accolades. 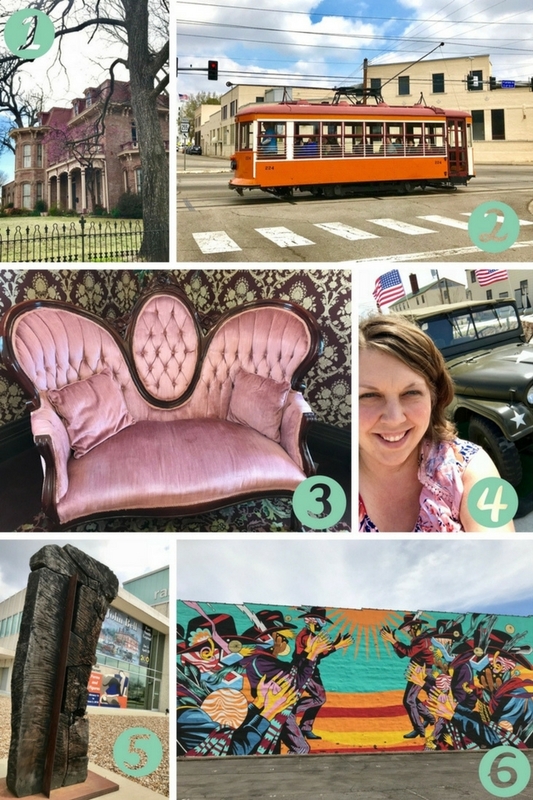 Often seen as the Western Frontier of Arkansas, Fort Smith has a rich history side but as of late is becoming known for its brewery development, public art, and as a destination spot for weekend adventures. Come along, bring your camera (phone!) and open your social media accounts. 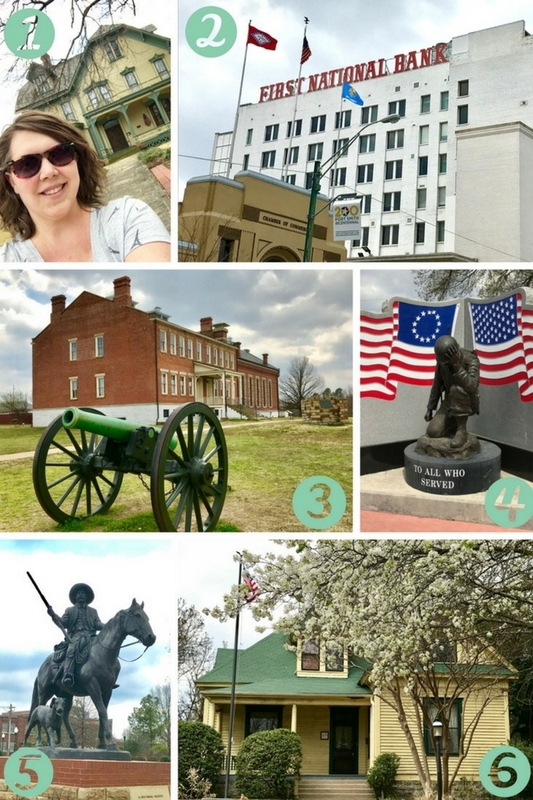 It’s time to capture the city on a selfie tour! 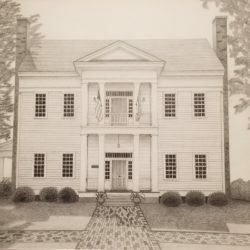 This house is now home to a museum that holds memorabilia from General William O. Darby. This was his childhood home and the living room is set as it was when his parents were informed of his death in 1945. Darby led a group through Italy during World War II known as the “Darby Rangers.” Cistern, Italy is Fort Smith’s sister city and other war artifacts can be found here as well as tributes to Darby and WWII items. Adjacent to the home is a Community Center and Church that many find fascinating as well. Visitors can tour from 8:00 a.m. – 1:00 p.m. Monday through Friday and on Saturday or Sunday by appointment only. This site is so important to the founding of Fort Smith and really put the city on the map for commercial and economic development. The building you currently see was built in 1909, but the bank was originally founded in 1872 as the National Bank of Western Arkansas. But, as the Western Frontier of Arkansas expanded and grew and the bank purchased and merged with others, the name was changed. Interesting fact, the current President of the Bank, Mr. Samuel T. Sicard, is the fifth generation of his family to reside in this position. Probably the historical center of the city, the National Historical Site is part of the National Park Services. 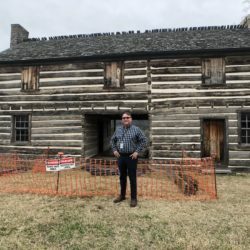 Here you encounter the history of the old Indian Territories, the first “Fort Smith” from 1817, and much of the story of famed Judge Isaac Parker. Don’t stick around too long or you might get caught up in the gallows! There is much to be learned here about Native Americans, as well as outlaws and those who worked so hard to keep them in line. Older than the Civil War, this cemetery was established on the grounds of a military post at the corners of the Arkansas and Poteau Rivers. The original establish of “the fort” included this land and at one point Zachary Taylor, later the 12th President of the United States, commanded one of the Divisions stationed here. Rich with history on its own, the cemetery is a quiet place to rest under the shade of the Tulip and Bradford Pear trees and breathe in the air of freedom and sacrifice. The cemetery is open daily from 7:30 a.m. until sunset. Bass Reeves is thought to be the first African American US Marshal. A runaway slave, Mr. Reeves served for 32 years under Judge Isaac Parker. Because he was illiterate, he memorized the information from the warrants about each man he was seeking and the trials involved and became illustrious among eastern Oklahoma and western Arkansas territories. Famed outlaw, Belle Star, even turned herself in after a decade of shenanigans when she learned Reeves was the one after her. The statue, planted in 2012, is large and a great commemorative piece of a famous lawman. This Italianate-style home serves as a memory of the Victorian time period in Fort Smith and living style on the edge of the Western Frontier. William Henry Harrison Clayton was the Chief Prosecutor for Judge Parker and moved into this home in 1882. The home is a great example of the antebellum time period and lifestyle for families of that time. The house is closed on Mondays, but other touring times and event details can be found on their website. This store first opened in 1948 by pharmacists C.E. Laws and has remained a staple in the community ever since. Now they are known as the drug store behind Chick-fil-A, but their drive-through and delivery services run all over the community. This statue was designed by L’Deane Trueblood and donated to the city by the Griffin family. The statue can be found along the Greg Smith River Trail behind the Park at West End. This city-owned park is full of eclectic treasures including a Ferris Wheel from the 1935 San Diego World’s Fair, an Italian hand-painted carousel, and a renovated railcar. It’s almost like you have to see it, to see how everything mixes together. Originally known as Fort Smith High School, the student body moved to a B Street location in 1928. Because of its size and the “newness,” the high school auditorium at the time was a gathering spot for regional and national arts from the Metropolitan Opera, to a fashion analyst, war correspondent, and even Miss America. In the mid-50s, it was the largest high school in Arkansas. The school has always stayed on the edge of expansion including a Fine Arts building on their campus and even a separate “sports store” as part of their athletic campus. Whatever you do, just be careful if you see a Maverick headed towards one of these Grizzly bears…things could get dangerous! All aboard! This museum is much more than just a place to board the Trolley Car for a trip around town. The Fort Smith Street Car Restoration Association who runs the museum is committed to all types of vehicles including motor buses, work equipment, locomotives and electric streetcars. Because they are an active restoration museum, each visit might be a little different than the last. A fascinating place amidst beautiful grounds and a building adorned with immaculate architecture. In 1878, the first Sisters arrived after a drive to build communities in this area. A Little Rock railroad company was seeing expansion and inhabitants to this area. They reached out to a Benedictine community in Indiana to help them and persuaded many German Catholics to settle in the area. These Sisters and the Monks that preceded them came to the area to minister to these new settlers and establish places of faith and schooling for those families. Today many intentional spaces have been created to invoke personal meditation and quiet spaces for reflection. This community park was established more than 70 years ago with the understanding that it would always be used as a community park and playground space. 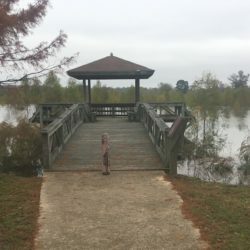 Today on these premises you can find families gathered and making memories at the picnic tables, on the walking trail, at the mini-golf course, public swimming pool, or on the specialized Miracle equipment. 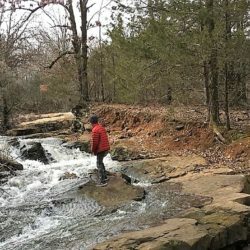 Creekmore Park serves as a reminder of the old and yet is alive with new moments of the day. Catch a connection on the Creekmore Train that runs May through October for $.25 per rider. Steve Womack is the current Arkansas State Representative for the 3rd District and has been in that position since 2011. Womack is well known for his 3 decades serving the Arkansas Army National Guard. Rail cars have been in operation in Fort Smith since 1883. Originally mule-drawn, they transitioned to electric a decade later and were fully integrated by the end of the century. Later open-air cars were replaced with enclosed, heated and cooled versions. But, through poor management and business decisions, the 1920s took a toll on the industry in town and private automobiles became more preferred. In November 1933, the cars made their final run and the company pursuing them was dissolved. You can meet the trolley anywhere in town and hop on and ride full circle. The tour rides all over the city until 5:00 p.m. Make sure you check the website for their daily schedule. Yes, you can come in for a bathroom break as well as to gather information on the city, but you will be intrigued by the stories these walls can tell. This was the original site of Miss Laura’s Social Club and is the only bordello still standing from a famed row in the red light area of the Old West city. Here you can see an old saloon, as well the garments and living quarters of the girls who lived among these halls. You may want to come back more than once and see which tour guide has the best stories! The Historic District of Chaffee Crossing brings together the past with the present. Fort Chaffee has a wide military history dating back to the WWII era. Between the Barbershop Museum, Army barracks, military vehicles, a doll museum and Enchanted Chapel, visitors walk through multi-war memorabilia and are afforded the opportunity to imagine life here for POWs and refugees. 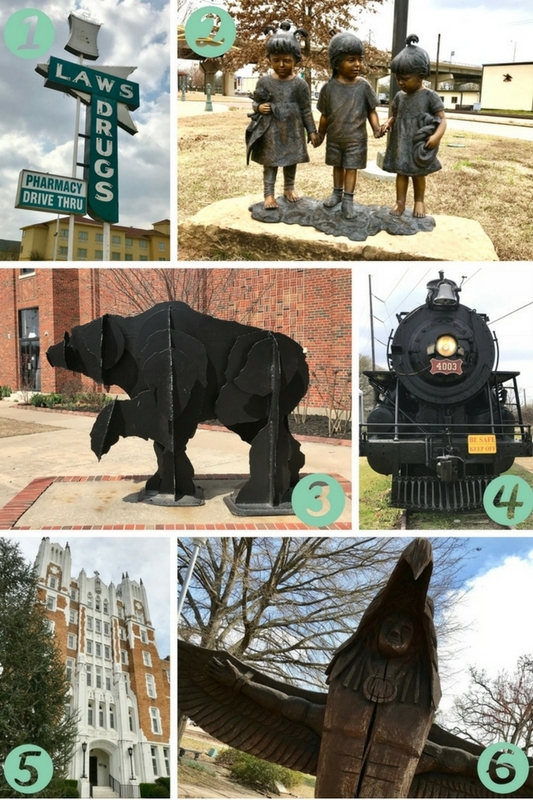 Many pieces of the history of Arkansas and the nation began here in a now revitalizing community on the rise. The RAM, as it is known, was founded in 1948, but was a roving organization conducting educational classes and exhibits throughout the city. But, after a generous gift from Arvest Bank, RAM found a home in their current location. The building they now occupy was listed on the Arkansas Registry of Historic Places as an example of Mid-Century Modern design which lends itself to a perfect home for an artistic community. RAM hosts classes and has become a regional resource for renowned exhibitions and local artists. September 2015 brought to town a group of artists to take back abandoned and deterring parts of the city. Each year more of the area is reclaimed as new artist return to continue the project. Make sure to tag #UnexpectedFS in your post to participate in the conversation online. Whether you make a contest of it, use it as a school curriculum or outing day, or gradually capture some of these as you stroll and meander the city, you are sure to be intrigued at each stop. And, I do encourage you to stop. Read the signs and listen to the storytellers. 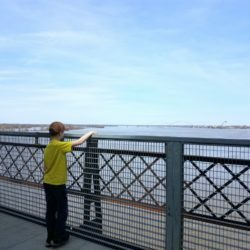 This is a city rich in history and is committed to rewriting it in the coming years as more changes are made, new areas are discovered and rebuilt, and the US Marshals Museum opens next year. Oh, the stories of days gone by we have yet to study and capture. Get to snapping!! !